Remember when games required the player to use their imagination? When places, characters and whole narrative worlds could be grown from paragraphs of white text on a monitor? When rudimentary representations were merely springboards for the player’s desire to experience new imaginative universes? Gamers of a certain age will still be able to fully recall, and may even still play primitive graphical and text based adventure games, but for many others (this reviewer included) such experiences remain vague childhood memories. Psydra Game’s adventure-RPG Dark Scavengers feels like a much needed exercise in hypnotic regression; an excavation of all those obscure, childhood adventures of the imagination which many of us lost amidst years of graphical realism and beautifully rendered 3D worlds. But to lump Dark Scavengers with the label of ‘nostalgic’ would be unfair. Such a label suggests a level of mawkishness which is entirely absent from this joyfully weird, silly and witty adventure. From the offset it’s clear that this game has a weird and brimming imagination. The game starts by introducing the player to his three allies which make up his or her crew. These are: a skeleton who builds weapons, an uncomfotably friendly green alien who can build you items, and an unspeakable horror, who can’t speak, who summons allies. With the power of these three aliens the player is then sent to a mysterious planet to find fuel for their stranded spaceship. In your search for fuel you quickly become involved in the local alien races, all of which are in the process of killing each other. The game’s world is deep and convincing even in its weirdness. The races you encounter each have their own cultures which are developed through encounters with eccentric characters dotted throughout the game. Such eccentricity is also evident in Dark Scavengers gameplay which takes the form of a well constructed hodgepodge of previous genres. The world itself is actually made up of rectangular rooms placed next to each other which the player navigates by clicking arrows on the screen which lead to the next room. When the player enters a room they are usually met by an enemy which leads to a fight. Combat is presented in a traditional first-person RPG layout, with the enemies lined up in a row before the player. The actual mechanics of combat are slightly different, however, with each of your three shipmates coming into play, giving you the choice of either choosing a weapon, item or an ally each turn. Once you’ve defeated an enemy you are then given an item which, when you move to the next room, can be given to one of your shipmates to construct new weapons, items or allies. Its a fun system which constantly gives the player something new to play with and adds an exploratory element to the game’s combat. 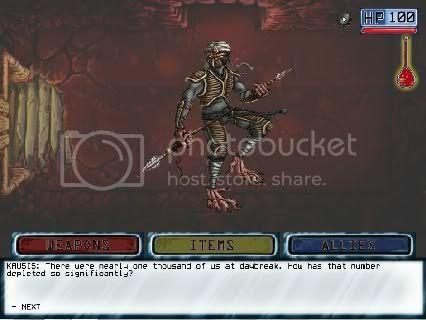 Outside of combat the player can also interact with each room by clicking on particular objects. This either leads to obtaining an item or sometimes you come across an enemy or a character to talk to. There are some puzzle and riddle elements reminiscent of The Hitchhikers Guide text adventure, but overall the gameplay is kept very simple. What’s really great is the focus on the imaginative nature of the game’s encounters. Combat and communication occurs with a simple, yet beautifully drawn still image of the character or enemy. There is no animation to speak of (unless you count the placing of these still characters on the screen) and therefore the game relies entirely on the descriptive and expressive power of drawing and writing. And these two things work perfectly. The drawings are reminiscent of old adventure books and card games while the writing is extraordinarily funny in both wit and silliness. For a game ultimately built around still images, Dark Scavengers is one of the most expressive games we’ve played in a long while. Some of the best moments are when the game has the player ‘diving’ and ‘leaping’ about, dodging enemies or helping friends. The stillness of the actual image only goes to show the brilliance of the imagination, achieving, in many ways, more than if the game were a fully rendered 3D experience. This is also helped by the game’s excellent sound and music which, like its art and writing, is both incredibly silly and wonderfully effective. 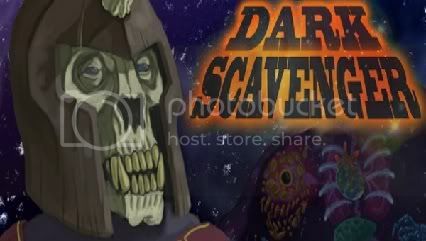 Dark Scavengers achieves not merely a nostalgic reminiscence but a full blown TV-drama-recollection of how computer games, even those lacking animation, can be unbelievably captivating and imaginative.